Taking a decade-by-decade approach to the University of Texas football tradition, this collection brings together over 40 stories from the most outstanding voices of the program. The spirit of Longhorn football is not captured by just one phrase, one season, or one particular game; instead, the student-athletes and coaches who made the magic happen over the decades blend their experiences to capture the true essence of their beloved school. Texas fans will relish the intimate stories told by the figures they have come to cherish. Bill Little is an award-winning writer who has worked with the University of Texas athletics media relations office for over four decades. 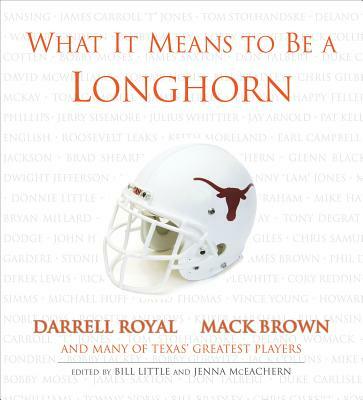 He is the author of six books on Texas Longhorn sports. He has written for the Austin American-Statesman and the Associated Press in Oklahoma City. He is a member of the Longhorn Hall of Honor and the CoSIDA Hall of Fame. Jenna Hays McEachern is a freelance writer and editor. She worked in the University of Texas sports information department as a student. She is the editor for One Heartbeat and One Heartbeat II in collaboration with Mack Brown and Bill Little. Darrell Royal is a former head football coach at the University of Texas at Austin, where he led the team to three national championships. He is a member of the College Football Hall of Fame and the university stadium was renamed in his honor. Mack Brown is the head football coach for the University of Texas at Austin. The team won a National Championship under his lead and he has been named a Big 12 Coach of the Year. They all live in Austin, Texas.